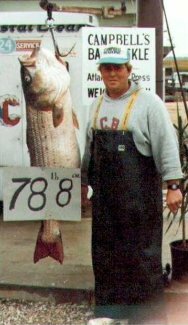 Although it's a great honor, becoming the world record striped bass holder can also accompany much speculation. The buzz can generate positive attributes, as well as a lot of negative criticism and scrutiny. But when the dust settles, and all is said and done, there can only be one remaining at the top. Is all the negativity from the critics worth having a record fish? There's always going to be those people who have nothing but bad things to say, rather than praising the ones who have accomplished such a highly praised task in which they, themselves could only ever dream of doing. After all, it wasn't them sacrificing their time and effort out on the water while fighting to bring in these world class stripers. 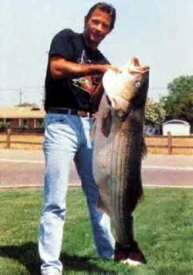 These are the two most notable and most recognized striped bass records. As you may already know, records carry out through each state, region and each country. There are many other records for many different class types, such as light tackle, age groups, public lakes and reservoirs, etc. Are you up for the challenge of setting a new record? Check the records within your region. You may be surprised to see a reasonable and reachable record for you to set your goals to. Do you have any pictures of your catch? Or a cool fishing adventure to tell? Share your striped bass pictures and check out the stories others have contributed.